...this latest item doesn't really fit the bill of what i had originally intended, but i'm going to go ahead and be satisfied as if it did. 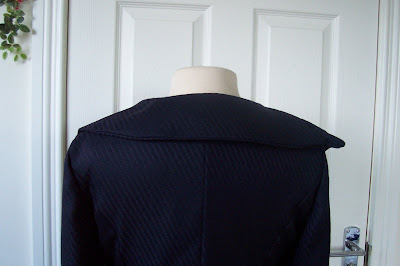 The picture is a little difficult to make out because the detailks are all matt navy... See that gigantic pretentious front collar?...that's what attracted me to this pattern. It feels really funny when you wear it...funny but cool! about tme you broke out this pattern!!! i had forgotten all about it! i think you should help me remember it by making one in just my size!!!! 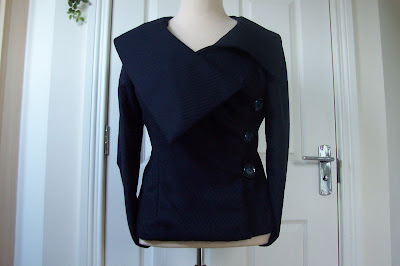 looks soo pretty and would be divine as a smart-casual suit! while you're at it i know someone who could do with a suit just like that - bout my height, my weight (unfortunately!) is ginger and loves presents! !